On May 16th, Operation American Spring will begin. The event’s organizers have been calling for up to 30 million people to go to Washington D.C. to demand that Congress impeach Barack Hussein Obama and do some housekeeping of their own. In this episode of The Truth Is Viral, host Bobby Powell and Operation American Spring spokesman Joe Bennett, the Pennsylvania state coordinator for OAS, discuss what organizers hope to accomplish when their followers descend on Washington D.C. on May 16th. These state coordinators represent almost 20% of OAS’s management-level volunteer force, and their resignations have thrown up some serious red flags. Richard Hall, a close personal friend of Col. Harry Riley and the man in charge of the entire volunteer effort, resigned after discovering that the FBI had placed moles inside the OAS leadership. The Truth Is Viral had originally taken a stand against Operation American Spring back in January when an investigation aided by Patriot broadcasters Kathy Rubio and Zeeda Andrews revealed that Maj. Gen. Paul Vallely – an uber-neocon and Tea Party darling – had once coauthored a paper for the Army on how to use mind control techniques to influence crowds ranging in size from unruly street mobs to the populations of entire countries with Col. Michael Aquino. Aquino is the founder of the Satanic Temple of Set, and even though Vallely has never been accused of being a Satanist himself (not even by this program,) his working relationship with Aquino – and the nature of that relationship (figuring out how to use mind-control on crowds just like the one expected in D.C. on the 16th) – I felt uncomfortable promoting the event. The next week TTiV reversed that stance after Col. Riley appeared on the Pete Santilli show and stated that Maj. Gen. Vallely had no official role to play in the leadership of OAS. This was backed up by an email from Col. Riley’s publicity agent who stated the same thing. Taking Col. Riley at his word that Vallely would have no part in the protest, and understanding that something must be done if the People are to regain control of their government, TTiV continued to positively promote Operation American Spring. But over the past week, information has been released indicating that Vallely will indeed be playing a role in the demonstration. This is extremely disturbing information. Several weeks ago I published an episode of The Truth Is Viral that documented the fact that from time to time I am being followed by unknown individuals in black humvees. A former high-ranking administrator within the OAS command structure informed me this week that the tail was courtesy of Maj. Gen Vallely, who had asked his personal intel chief to investigate me. Apparently the General does not like to have the truth told about his connections with devil worshipers or his trips to Syria where he was very vocally supporting the same al-Qaeda terrorists in the Free Syrian Army that John McCain is so fond of swapping spit with, the very same terrorists – Abdul Hakin al-Hasidi and Abdel Hakim bel-Hadj – that were responsible for the US-backed insurgents who murdered Libyan dictator Moammar Gadaffi. Guess who doesn’t care what the general doesn’t like? Buckner went on to speak at length about all of the little red flags that have gone up during his short tenure as the Washington D.C. coordinator for OAS; red flags that include OAS organizers planning to put as many militia as possible into the Bull Run Regional Park Campground instead of spreading them out. Remember when the Army Air Corp bunched all of their planes together to keep them safe from sabotage on Dec. 6th 1941? That worked out great didn’t it? Gramma always said, “Don’t put all of your eggs into one basket.” Ssgt. Willie always said, “SPREAD OUT! One mortar round would take out all of you assholes!” It is against sound military doctrine to concentrate your troops in one spot on the eve of a battle, and a seasoned military commander like Col. Harry Riley would know this. Eight state coordinators from Missouri, Oregon, Pennsylvania, Texas, W. Virginia, and two from Nevada have quit OAS in recent days, all stating concerns about the safety of Patriots who plan to attend. One major concern shared by all of those former volunteers is that the federal government might send agent provocateurs into Washington D.C. to turn the event into a “bloodbath.” Seeing as how federal agents have already been caught infiltrating the movement, and taking into account incidents like Ruby Ridge and Waco where the government showed little concern – and no mercy – for any who oppose them, this appears to be a legitimate concern. Officially, OAS is supposed to be completely a completely peaceful and unarmed event designed to get Congress off of their corrupt and/or just plain lazy butts and impeach Barack Hussein Obama. Unofficially, armed militia are being told to stand by just outside the District of Columbia. Emboldened by their stunning victory at the Bundy ranch where armed militia forced federal agents to turn tail and run, militia members may be hoping for a repeat. Not wanting to rain on anyone’s parade, but Barack Obama and Eric Holder are not going to let anyone walk into “their house” and slap them around as was done in the deserts of Nevada. Their egos will not allow it. They also aren’t just going to leave office just because a bunch of angry Americans show up at the front gate of the White House to demand their impeachment and imprisonment. The Communist plan to put Bathhouse Barry into office has been in the works since the 60’s since Obama was nothing more than a red diaper baby. They aren’t just going to give up and walk away. Patriots who supported the Bundys were immediately attacked by the Left, the charge led by Nevada Senator Harry Reid, a man who holds the distinction of being the most corrupt member of the Senate, and they were labeled “racists” and “domestic terrorists.” Imagine the response from the feds if Obama felt as though his tenure as POTUS were in serious jeopardy. According to the new rules laid down in the NDAA and the AUMF, the United States is now a battlefield where American citizens no longer enjoy the protections provided by the 5th Amendment if Barack Obama or one of his goons say they don’t apply. Barack Obama, Eric Holder, and CIA chief John Brennan have all refused to rule out the use of drones domestically. This is particularly disturbing because Obama already has 3 “kills” of natural-born American citizens to his credit, earning him the title “Judge, jury, and executioner” from the normally ultra-liberal ACLU. None of those citizens were even so much as charged with a crime in a court of law, not even a military tribunal, before Obama ordered their deaths with his pen and phone. The deaths of Anwar al-Alawki, Samir Khan, and al-Alawki’s 16-year-old son Abdulrahman were – in the opinion of this writer – a test case designed to gauge the reaction of the American people to the extra-judicial murders of three of their fellow citizens. After all, who’s going to miss a couple of scumbag hadjis right? Sheriff Richard Mack’s Constitutional Sheriffs and Peace Officers Association has also withdrawn its support from OAS. CSPOA spokesman Sam Bushman said that the leadership at OAS “had no plan” past the initial day of protest. OAS spokesman Joe Bennett said that Articles of Impeachment and a 33 count list of grievances had been hand-delivered to all 535 members of Congress, but none of the legislators that the OAS literature calls upon to help the People peacefully transition to a new government have responded to that call; none that he could name anyway. Although it was an excellent idea and many fine Patriots have been working tirelessly to pull it off, Operation American Spring has been thoroughly compromised. FBI moles have been discovered in the OAS leadership ranks – outed by Col. Riley’s close friend Richard Hall – eight state coordinators have quit as has OAS’s only major supporter in the form of the CSPOA, and finally, despite repeated assurances that Maj. Gen Paul Vallely would have no part of OAS, he will. Now that the event is only days away it appears that Vallely will, in fact, be playing a large role, bringing his Tea Party Nation and Stand Up America groups in for support. I’m not one to care about danger. I am a child of the Living God, I am Saved by the blood of the Lamb. What is the worst thing they could do, kill me? Ha. If I die I’m going straight to Heaven, do not pass go, screw the $200. Threatening me with death does not scare me. If my wife were not barely hanging on to life I would go to Washington D.C. to cover Operation American Spring no matter what might happen because that’s what journalists do. Since I do not know how much longer she has to live, I’m not going to take the chance of being away when she needs me most; when Father calls her Home. If I were away when she passed I would never be able to forgive myself. I can NOT advise that any of you do the same. 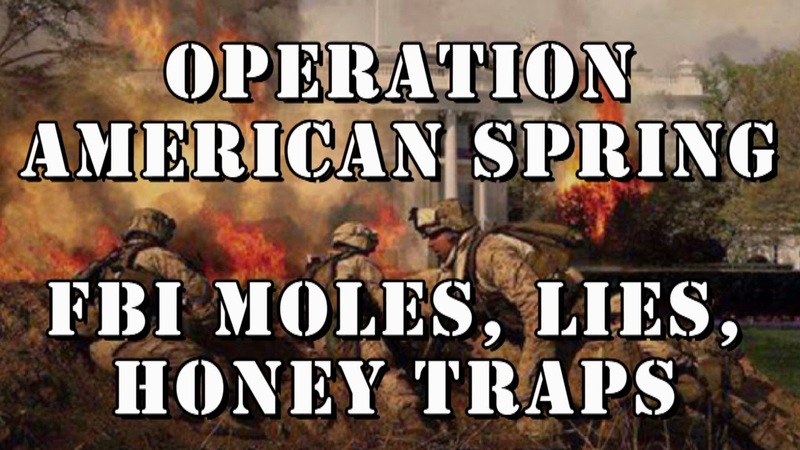 Whatever Operation American Spring might have once been, it is my considered opinion as a tactically trained US Marine – an opinion shared by several Marine and Army combat veterans expressed during this show – that it is now a controlled opposition FBI honey trap designed to identify, and possibly arrest and/or harm, Patriots that plan on attending OAS; particularly those who have been herded into the Bull Run Regional Campground. Any Patriots and militia that still plan on attending OAS on May 16th should be aware of one thing: Militia members at the Bundy ranch are now being investigated by the FBI after Las Vegas Metro, Clark County, and federal officers claimed that they felt threatened by the presence of militia with loaded weapons at the ranch. There is no way that the government will ever be able to prove that any particular Patriot ever aimed his weapon directly at a law enforcement officer; but that will not prevent them from “SWAT Teaming” suspects at 3 a.m. I think we’ve seen all too clearly that when someone is “SWATTED,” whether they are guilty of a crime or not (cops have a bad habit of going to the wrong house and killing the wrong people – and getting away with it,) it very seldom turns out well for the victim. I will continue to keep everyone who plans to take part in OAS, and those who intend to oppose the event, in my prayers. I will pray that the brave Patriots who intend on standing up to Tyranny will be kept safe, and that the traitors that oppose them will see the error of their ways before it is too late, that if they try to fire on peaceful protestors their weapons will jam, and that they will be blinded and unable to take aim if they get a Patriot in their sights.